1. The North Cape - The midnight sun is spectacular here. Whilst the view from the coast can sometimes be foggy in summer, the view of the horizon is panoramic and sets the perfect stage for a lightshow on a clear day. 2. The Svalbard Islands - On this archipelago the sun does not set between late April and late August. Despite its isolated position in the Arctic Sea, Svalbard is getting more and more popular with tourists due to its dramatic nature. A hike in the Svalbard mountains can also include encounters with local polar bears, so make sure you are accompanied by a tour guide. Glacier walks and dog sledging are also bookable modes of travel under the midnight sun! 3. Bodø - Bodø is a seaside city of about 50 000 inhabitants, where you can experience the night light around midsummer; typically between 2 June and 10 July. Warning: tourists searching for an early night, may find it hard to get to sleep! 5. The Lofoten Islands - This picturesque group of islands off the coast offers an amazing taste of the Norwegian fjords. Island hopping is an ideal way to experience the dramatic surroundings.You can visit Lofoten by car or bus and there are bridges and ferries connecting the small, traditional fishing islands with each other. Why not play a round of golf at Lofoten Golf Links at midnight without artificial lighting? Or night hike up a local mountain and enjoy the clean spring water to be found at the peak? 6. Hammerfest - If you make it this far north, congratulations! The journey was worth it and the midnight sun shines throughout the summer months. Actually the sun almost never sets during this time. 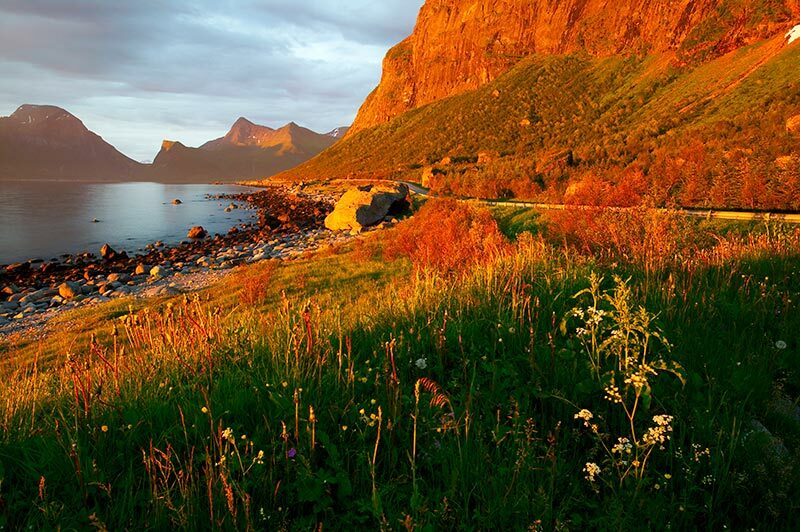 It is quite different from the southern parts of Scandinavia and complements the midnight sun experience. The contrast between reindeer wandering in the wilds of Finnmark and the nearby city of Hammerfest make this a worthwhile destination. 8. Andenes - The town of Andenes on Andøya Island, the most northerly of the Vesterålen islands, offers a convenient vantage point for experiencing the light at night. The cape of Vesterålen has sandy beaches where you can take a dip in the ocean, providing you can handle bracing temperatures that will get your blood racing! Andenes is the home for Norway's rocket launching community at their Space Centre. 9. Stø - Whale and seal safaris embark from this tiny old fishing village where you can take a night boat to experience the midnight sun while seeing these majestic sea creatures play. Because of the deep, cold water currents of the Bleik Canyon, large plankton blooms float to the surface and this supports a wide variety of marine life, including: seals, whales and birds. This region is the home of many thousands of birds and you can take a guided bird-watching trip, also of course, at night.